Growing up in Singapore, PhD student Jared Bok saw firsthand the "beautiful messiness" of a multi-religious society, including the interactions between missionaries and local residents. His dissertation focuses on the expansion of Protestant missionaries over the last 50 years. As a child growing up in Singapore, Jared Bok developed an early interest in the nuanced presence and practice of Christianity in a country rich with diversity of peoples, cultures and religions. "I learned firsthand the kinds of negotiations Christians sometimes make when trying to hold true to their beliefs about faith and love while also realizing that their traditional methods of conversion sometimes cause resentment amongst their target audience," he explains. "These Christians, therefore, find themselves occasionally needing to make practical compromises that, at the same time, cannot be seen as compromises to their faith." This interest led him to the Laney Graduate School's doctoral program in sociology, and to his current work on a dissertation that combines three fields of scholarship: religion, organizations and globalization. "I was born and grew up in Singapore, which, like many other countries in Southeast Asia, is a multi-religious society with all the beautiful — and sometimes not so beautiful — messiness that that implies," Bok explains. "A part of that messiness and complexity arises from the interaction between Christian missionaries and local residents who, themselves, hail from multiple other countries and multiple religious traditions." Bok's interactions with some of these missionaries led to astute observations about the adaptations — and rejections — of Christian doctrine and practices in a multicultural context. His dissertation examines how Protestant missionary agencies in the U.S. have expanded over the last 50 years, both in terms of the countries in which they conduct their ministries, as well as their various types of activities, from evangelism to relief and development. To determine the factors contributing to how (and how fast) these agencies expand, Bok compares national data on these organizations from 1953 to 2010 with international data from all the countries where these agencies operate during that same time period. "While scholars and non-scholars alike may continue to disagree about whether the cross-national influence and role of American Christianity in global religion is desirable or not, this influence remains very real and will likely continue in this way for the next few decades," he says. "I wanted to be part of the growing body of scholars tracking and seeking to explain this role as enacted by religious groups themselves." 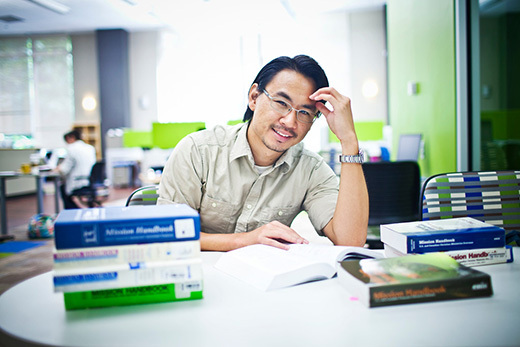 At Emory, Bok found a supportive intellectual environment in the graduate program in sociology. What he did not anticipate discovering, however, was a very deep passion for teaching. "Thanks in large part to the PhD program in sociology and more recently my involvement with the Laney Graduate School's TATTO (Teaching Assistant Training and Teaching Opportunity) program, I not only continued to develop my interest and skills in conducting academic research, but also came to a realization about teaching at the college level," he says. "I love it!" Recognizing Bok's skills and passion for teaching, his program nominated him for the Dean's Teaching Fellowship (DTF), which supports students whose records demonstrate excellence in teaching and who will complete their doctoral degrees in the fellowship year. As part of his DTF responsibilities, this semester Bok is teaching a course called Religion in Global Motion. Related to his dissertation work, the course explores the various ways in which religion operates, changes and interacts with society as it moves across geographical and cultural borders. Students learn about how, in an era of modernization and globalization, it becomes increasingly difficult to pin down religion to geopolitical boundaries. As it moves globally, it transforms just as much as it is transformed. In the course, students study the ways transnational religion is connected to topics like immigration, humanitarian efforts, foreign policy, pilgrimage and religious tourism, conflict and violence, and more. And as Bok's graduate career winds down, he is absolutely certain about one thing: teaching is in his future. "I have clear and strong intentions to continue teaching at the college level," he says. "And thanks to my highly positive teaching and teacher-training experiences, I now know what I would like to see in the teaching institutions to which I intend to apply."